In June 2016 it will be exactly twenty years since the Study Group ‘Anthropology of Music in Mediterranean Cultures’ met in Bari-Molfetta, Italy, for a conference titled ‘Musicians in the Mediterranean: History and Anthropology’ in conjunction with the festival organised by Mousiké. Conceived as a meeting of historical musicologists and ethnomusicologists, the conference combined historical and ethnographic methods and perspectives on topics relating to music, musicians, and musical transmission in the Mediterranean and beyond (Conference report by Philip Bohlman: http://www.fondazionelevi.it/ma/ma_stg/ma_rep1.htm). 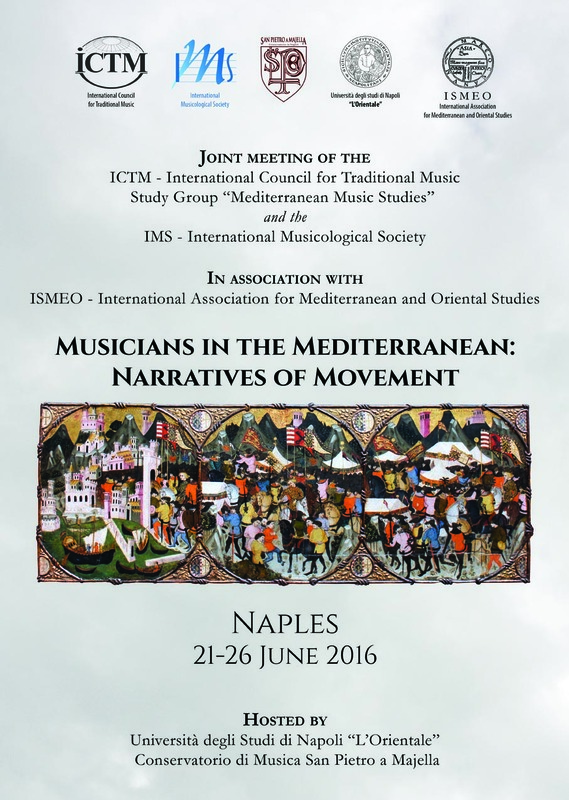 This first joint symposium of ICTM and IMS, organised by the ICTM Study Group ‘Mediterranean Music Studies’, seeks to renew that intradisciplinary collaboration, focusing on the theme ‘Musicians in the Mediterranean: Narratives of Movement’. We invite papers that address music as narrative and musicians as narrators of movements of peoples, cultures and civilisations through time and space, focusing on musical genres, styles, repertories and practices of the Mediterranean region, broadly conceived, including diasporic communities. Participants are encouraged to explore processes of cross-cultural fertilisation, interaction and exchange, of transformation and loss, and of musical conservation and control, as societies attempt to comprehend and come to terms with conditions of physical and temporal flux. How do different types of movements sound? How do language, gestures, and sound narrate each movement? What is sounded and what is silenced? Which sounds/gestures are meaningful? And for whom? Answering these and other critical questions requires an understanding of the structural and aesthetic factors that govern musical organisation and, concurrently, a frame of reference in which music can be understood in terms of its wider cultural meanings. Papers may also address narratives about music, including the histories, myths, and intellectual traditions that have evolved around movements of musicians, musical instruments, repertories, styles, and practices across and beyond the Mediterranean. Just ten minutes by car from the city centre, Naples airport is well-served by major international airlines including British airways, Air France, Germanwings, Easyjet, Transavia, Vueling, Air Berlin, Air Arabia, Lufthansa, Meridiana, Turkish airlines, Iberia express, Tunis Air Express. http://www.aeroportodinapoli.it/Naples is also served by boat to Naples port, by train, and by local buses. The conference venues are in the historic centre, the nearest underground station is Dante. The journey planner available at http://www.anm.it/ gives directions for travel within Naples via public transport. Recommended Hotels and B&Bs, all within walking distance of the symposium venues. List compiled by Salvatore Morra (morrasa@hotmail.com). Those marked with *** are especially recommended. Casa Alba Laeta (two metro stops from Dante), convent.